U bent hier: Parsifal > News > Products > simple > Don Santiago Jimenez Y Sus Valedores – Viva Segun! Don Santiago Jimenez Y Sus Valedores – Viva Segun! 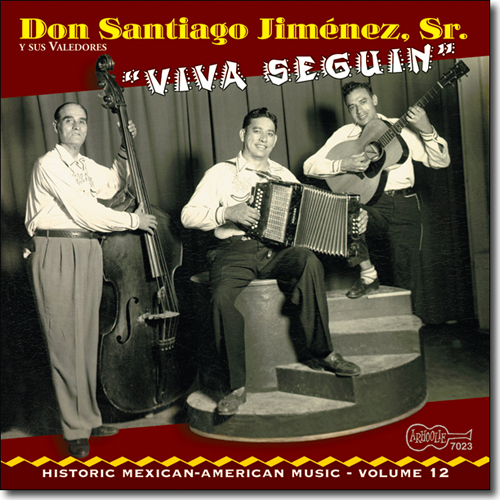 These 27 performances -- mostly instrumental, but sometimes vocal -- were originally released between 1947 and 1951, when the accordionist was reaching the peak of his popularity in the San Antonio area. 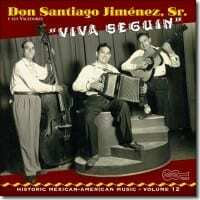 More often polkas than anything else, these were recorded with full-band accompaniment featuring various combinations of guitar, bajo sexto, bass, and backup vocals. 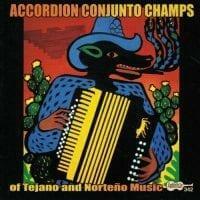 It's representative music of the time in the mid-1900s when the Tex-Mex style known as conjunto music was becoming established as a popular style in its region, with the accordion at the fore. The songs vary some in pace, but the tunes and arrangements have enough similarity to each other that listeners not enamored of all things conjunto may find it to drag over the course of an hour-plus; the occasional vocal makes for welcome changes from the same-old.